Tablet PC based mPOS systems are an economical POS solution for micro-merchants. Seoul South Korea (PRWEB) - BIXOLON, a leading global manufacturer of dependable and innovative POS receipt, mobile and barcode label printers, introduced its first tablet PC based Mobile Point-of-Sale (mPOS) solution at ‘Retail's BIG Show’, hosted by the National Retail Federation (NRF). The tablet PC based mPOS solution is comprised of BIXOLON's SRP-350IIOBE Receipt Printer along with Samsung Galaxy Note 10.1 (2014 Edition). BIXOLON and Samsung Electronics have formed a strategic partnership with plans to enter the U.S. mPOS market by promoting their solution’s strong points while pairing both companies’ products with excellent capability and quality. 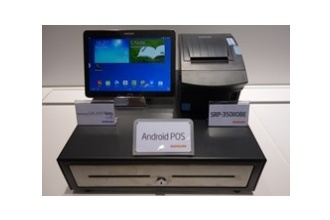 Tablet PC based mPOS systems are an economical POS solution for micro-merchants. They not only reduce economic burdens by requiring a low monthly service fee, but ease the strenuous process of managing stores. In addition, they can capture customer information which can be used for sales analysis and to offer coupons to valued customers. This customer relations management (CRM) marketing method is then applied via a Cloud server through wired and wireless communication, without any pressure on data quantity. Such products are suitable for small stores as this mPOS solution requires less counter space than current fixed large POS systems. BIXOLON's SRP-350II OBE receipt printer is compatible with both Android and iOS operating systems, and has a great advantage in its capability to connect by means of either Bluetooth, USB, and/or Ethernet interfaces. With an option for MFi certification, this smart printer is able to work with any Apple product such as the iPad, iPhone or iPod. The BIXOLON SPP-R300 Mobile Printer is highly acclaimed in the global market. With multiple drop resistance of 1.5 m (5 ft.), and available IP54 rating (with protective case), the SPP-R300 is designed to withstand rugged outdoor use and perfectly fits the needs of the logistics and field service industries. The SPP-R300 also uses various types of media, including: receipt paper, labels, and linerless labels and is compatible with Android, iOS, and Windows operating systems. BIXOLON CEO JS Oh stated, "BIXOLON quickly finds market changes and movement. We reflect new technologies in our products through market demand, and do our best to launch well developed and value added products for customers. BIXOLON will satisfy customers and continue to develop and modify our products as the industry progresses." BIXOLON’s POS receipt, label, and mobile printers’ advanced technologies provide a wide array of innovative solutions for such industries as retail, hospitality, healthcare, banking, post/parcel, and warehousing. BIXOLON’s thermal, impact and inkjet printers’ intuitive POS software offers extensive customization capabilities. A leader in the global specialty printer market, BIXOLON formed as a mini printer division of Samsung in the 1990’s, and spun off in 2002 to form its own entity.